Christmas Tree Nails - Polish Etc. For some reason I can't seem to paint a Christmas Tree on my own nails. I can paint a tree on paper, I can even paint a tree on someone else's nails, but not my own for some reason. Instead I chose to interpret this challenge prompt as Christmas ornaments! Each of my nails has a pattern similar to what you'd see as an ornament on a tree. I'm really starting to like nail art with a bunch of combined patterns and this one was a lot of fun to wear. I used my smallest nail art brush and some dotting tools to make these patterns. What do you think? Does it remind you enough of a Christmas Tree? Tomorrow I will be participating in the Blogger Day of Silence for the tragedy that struck Newtown Connecticut and the rest of our nation. 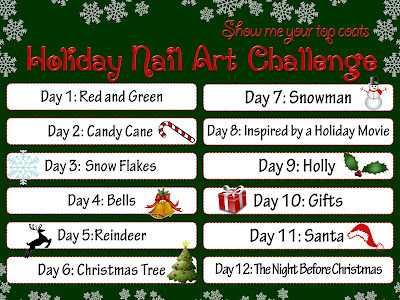 I will be back on Wednesday with more holiday nail art! This is so pretty! It does remind me of a Christmas tree (all except the ring finger), it's still pretty though. :) I love that A-England Dragon...I don't know why I don't have it or St. George, yet. I'm now following you on twitter! Twitter is so new and foreign to me! LOL!